【Breaking News】Kaiphone Technology (KAIFLEX) got certificate of UL 1203 standard in September, 2018. 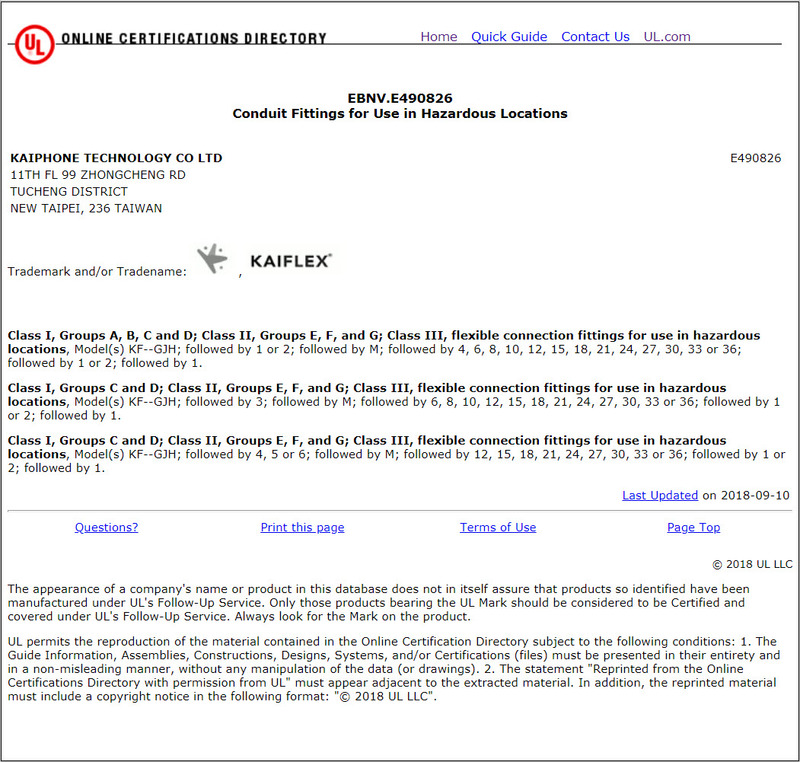 - Kaiphone Technology Co., Ltd.
【Breaking News】Kaiphone Technology (KAIFLEX) got certificate of UL 1203 standard in September, 2018. [Breaking News] Kaiphone Technology (KAIFLEX) got certificate of UL 1203 standard in September, 2018. That makes Kaiphone Technology get the 3rd place of UL certified manufacturer for the Explosion Proof Flexible Conduit. Explosions occurred in various industrial environments at home and abroad have been reported. Such kind of incident always results in serious loss on life and property. In recent years, it has gradually caused more and more attentions to the issues of explosion protection. Countries around the world are actively promoting the importance of explosion-proof and develop regulations to implement the measures of explosion-proof. Kaiphone has launched research, development and applied test in past 3 years and finally been successful to obtain the certificate of UL 1203 explosion proof (E490826). We would like to share this good news and work together with partners in this industry to establish a safer environment. The relative product information of Explosion Proof Flexible Conduit will be uploaded to our website. Before that, if you have any requirement or questions for our explosion proof products, please feel free to contact us and we would be pleased to reply at any time.